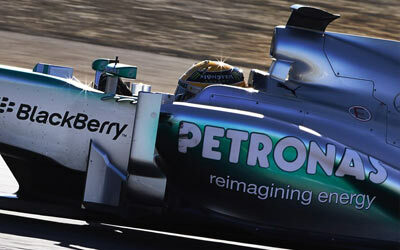 Nico Rosberg topped the timesheet after the first day of testing at Circuit de Catalunya near Barcelona. Rosberg did not complete a massive amount of laps due to a lengthy gearbox check in the early part of the session. His best lap came around 4 pm. Second fastest was Kimi Raikkonen in the Lotus, a mere 0.007s slower than Rosberg in the Mercedes F1W04. The Finn appeared to have no problem lapping quick around the track, continuing his strong run from Jerez. Fernando Alonso meanwhile was in the Ferrari for the first time this year, completing 110 laps with a best of 1:22.952. He suffered no technical issues with his Ferrari F138 whatsoever, with in the end of the session narrowly beating Sebastian Vettel's time that topped nearly the entire afternoon. Pastor Maldonado enjoyed the first day of testing with the new Williams FW35. He was pleased with its performance, and after a shakedown of the car at Idiada earlier, the team could immediately kick off with performance and reliability testing, rather than the usual system checks.